Situated between the patchwork of fields that makes up the Ribble Valley and the high moors of Pendle Hill we are situated close to a wide variety of habitats. The upland pastures and wetlands are home to summer visiting Curlews Oystercatchers and Lapwings. Higher up are moorland species such as Grouse and the rare Ringed Ouzel. The more traditional farmland around us is home to many bird species and mammals such as the Brown Hare. 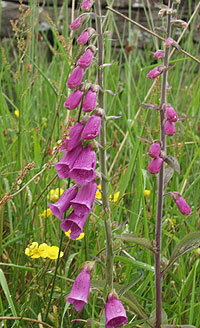 Our local hedgerows, fields and verges are full of wildflowers and there is always something to see throughout the year. Bluebell Wood is a delight in spring, carpeted in waves of blue. Wildlife identification books are availabe for you to borrow and we have a wildlife scrap book where you can record what you have seen. 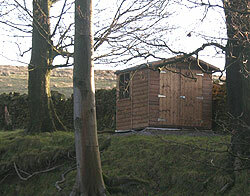 Below our own bird hide set within woodland. We also have Hedgehogs, Hares, Foxes, Moles, sika Deer, Grey Squirrels, Voles, and Bats.